The Republic of Haiti (French: République d'Haïti; Haitian Creole: Repiblik Dayiti; Spanish: Haití - also spelled Hayti in the 19th century up to the early 20th century - as in this Tobacco Advertisement from 1888.) 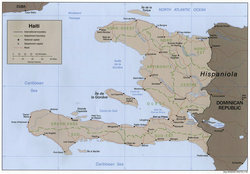 a country situated on the western third of the island of Hispaniola and the smaller islands of La Gonâve, La Tortue (Tortuga), Les Cayemites, La Grande Caye, and Ile a Vache in the Caribbean Sea, east of Cuba; Haiti shares Hispaniola 1, part of the Greater Antilles, with the Dominican Republic. Haiti is the second republic in the Western Hemisphere, after the United States and the first republic founded by people of African ancestry. Under French colonial rule Haiti was named Saint-Domingue. The name Haiti derives from the Arawak language of the native Taíno and means land of the mountains. This is the name chosen by Jean-Jacques Dessalines after the victory over the French colonizers in 1803. 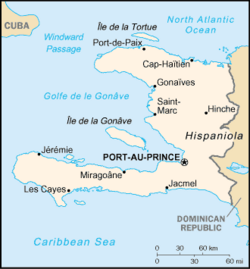 Pronounciation of Haiti: /ˈheɪtiː/; French: Haïti, pronounced: [a.iti]; Haitian Creole: Ayiti. Note: For Haiti before the revolution, before independence from France in 1804, see: Saint-Domingue. Image of François Capois on a Haitian banknote. The Haitian Gourde (Kreyòl: Goud) is the currency of Haiti. 1 Gourde = 100 Centimes. 1 Haitian Dollar = 5 Gourdes (this unit does not exist as paper note). Haiti became independent on January 1, 1804, the date on which Jean-Jacques Dessalines read the Haitian Declaration of Independence, on the Place des Armes in Gonaives. It was drafted by Boisrond Tonnerre. The nation of Haiti comprises the western one-third of the island of Hispaniola, west of the Dominican Republic and between the Caribbean Sea and the North Atlantic Ocean. Haiti's geographic coordinates are at a longitude of 72° 25′ west and a latitude of 19° 00′ north. The total area is 27,750km² (10,711 sq miles) of which 27,560km² (10,638 sq miles) is land and 190km² (73 sq miles) is water. This makes Haiti slightly smaller than the U.S. state of Maryland. Haiti has 1,771km (1,100 miles) of coastline and a 360km (224 miles)-border with the Dominican Republic. Haïti is the French spelling of the Taino name Ayiti (transl. Land of the Mountains). Haiti's lowest elevation is at sea level; its highest point is Chaine de la Selle at 2,680m (8793 ft). There are no navigable rivers. Lake Étang Saumâtre, Haiti's largest salt-water lake, is located at coor 18°35′N 72°00′W in southeastern Haiti, bordering the Dominican Republic. The lake has an area of around 168 km² (65 square miles) and is 29 km (18 miles) east of Port-au-Prince on the fertile Plaine du Cul-de-Sac. Some 29km (18 miles) long and up to 9.7km (6 miles) wide, the lake supports over 100 species of waterfowl, flamingos and American crocodiles. The colour of the lake is an intense shade of blue and this picturesque lake is skirted by brush and cacti. 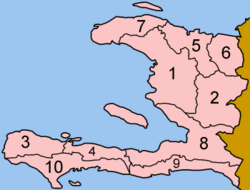 Map of the departments of Haiti in alphabetical order. The Haitian national anthem, La Dessalinienne was adopted in 1904 and named in honor of the the independent nation's first ruler and revolutionary hero: Jean-Jacques Dessalines. Note 1: A Taíno name for Hispaniola, still used in the Dominican Republic and Haiti, is Quisqueya (Kreyòl: Kiskeya) meaning: 'the cradle of life'. This name is preferred by many, since Hispaniola is the name given by the colonizers that nearly destroyed the native people and their culture and also established the slavery on the island. Colonial Haiti - Saint-Domingue - Haiti during French colonialism. 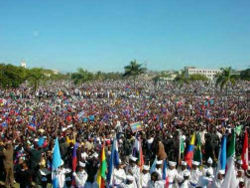 Declaration of Independence - Text of the 1804 proclamation, making Haiti the second republic in the Western Hemisphere. Caribbean Sea - The sea south of Haiti. Maps - Of Haiti, Saint-Domingue and related areas. Hispaniola topography - Topography of the entire island. List of Websites - Websites related to Haiti and Haitian history. Lecture on Haiti by Frederick Douglass - 1893 speech given at the Chicago World Fair. Monroe Doctrine - U.S. policies in the Americas laid out by President Monroe in 1823. Departments of Haiti. (2005, November 26). Wikipedia, The Free Encyclopedia. Retrieved 07:35, December 4, 2005 . Autorité Aéroportuaire Nationale - AAN - Haitian Airport Authority, information on air travel to and in Haiti in French and English. This page was last modified on 23 October 2009, at 19:04.